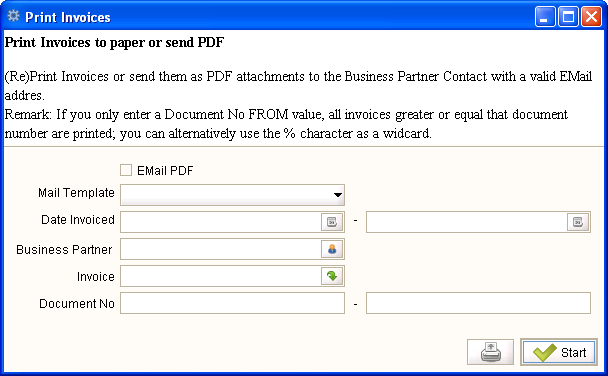 Help : (Re)Print Invoices or send them as PDF attachments to the Business Partner Contact with a valid EMail addres. Remark: If you only enter a Document No FROM value, all invoices greater or equal that document number are printed; you can alternatively use the % character as a widcard. Mail Template Text templates for mailings The Mail Template indicates the mail template for return messages. Mail text can include variables. The priority of parsing is User/Contact, Business Partner and then the underlying business object (like Request, Dunning, Workflow object). So, @Name@ would resolve into the User name (if user is defined defined), then Business Partner name (if business partner is defined) and then the Name of the business object if it has a Name. For Multi-Lingual systems, the template is translated based on the Business Partner's language selection. This page was last modified on 14 December 2006, at 12:24.